Not that the lights really help very much when it is pitch black, but one has, with some fantasy, the possibility to guess what there is on the piano score. As always, what we try to do should have some form of old style. Of course, I'd prefer to go around just with candles and kerosene lamps, but I would really need a maid then...(which I'd need anyway). Anyway, electricity did come to Åkarp 1912, so we can assume at least a century of lamps being used. In the specific, I have managed to find on the online flea markets two wall sconces old style. I don't know how old, but they looked nice enough (sometimes, it is just too time taking to find the right item and one has to get happy with a good mixture that compromises aesthetic, price and style. The big effort we made was in finding relatively good looking lightbulbs, cord and switch. The bulb was not straightforward. But we decided to go for a LED lightbulb (dimmable!) with an old-ish look. Cord and switch was bought at Byggfabriken. 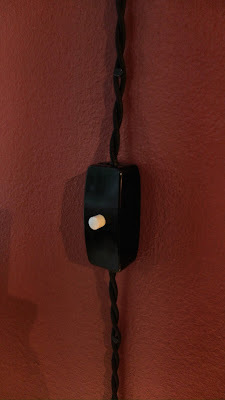 A nice bakelite switch with a black textile cable, which I chose to be in black. 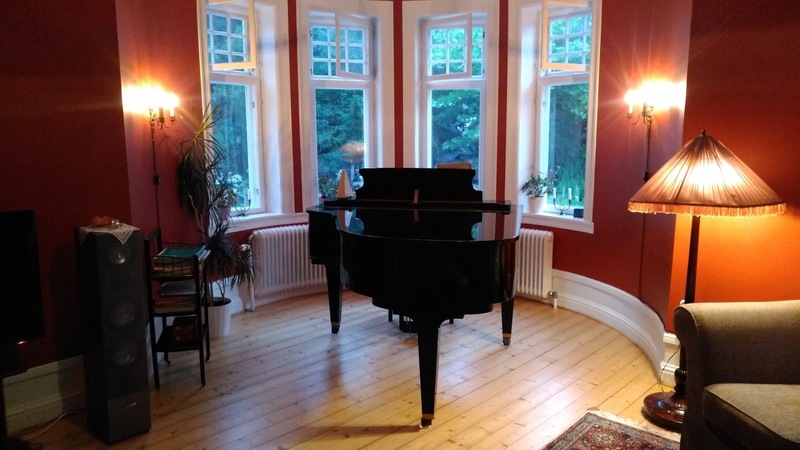 I thought it'd work beautifully with the colors of the room and especially, with the grand piano. One should mention though that I managed to have to return twice to the shop (which is one of my favorite, of course!) 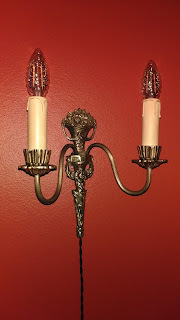 since I had bought the set only for a sconce and not two!! What a pity! I had to go back and fix the problem! Thanks for sharing your post. Luxury Apartments in Anna nagar available at affordable prices with world class amenities and international standard clubhouse. Do check out!